no, I’m not going to follow that with #ThatsWhatSheSaid, because this is a serious answer to a serious question. The question of what effect new speed skating suit technology can have, which has inspired the first feature article of my winter olympics coverage. The picture above is of the first ever recognised world champion in the sport of speed skating – Jaap Eden, a dutchman, and for whom the ice track in Amsterdam is named. That is how they used to dress in those days. One can only guess that the reason they dressed like that when they skated is because that is how they dressed for regular everyday life, and that changing clothes for sport was bothersome. Other reasons probably also have to do with the temperature – ice skating, being a winter sport, and taking place on ice, exposes the athlete to cold temperatures, and one generally wants to be warm when participating in sport. Of course, there are other considerations. Speed skating, as the name suggests involves high speeds, and as we all know, air resistance increases as square of the velocity. Even in those days, skaters were not slow, and having all that loose clothing flapping around in the wind would have surely hindered their progress. However it wasn’t until Franz Krienbühl of Switzerland introduced a one piece form-fitting skating suit in… wait for it… 1974(!) 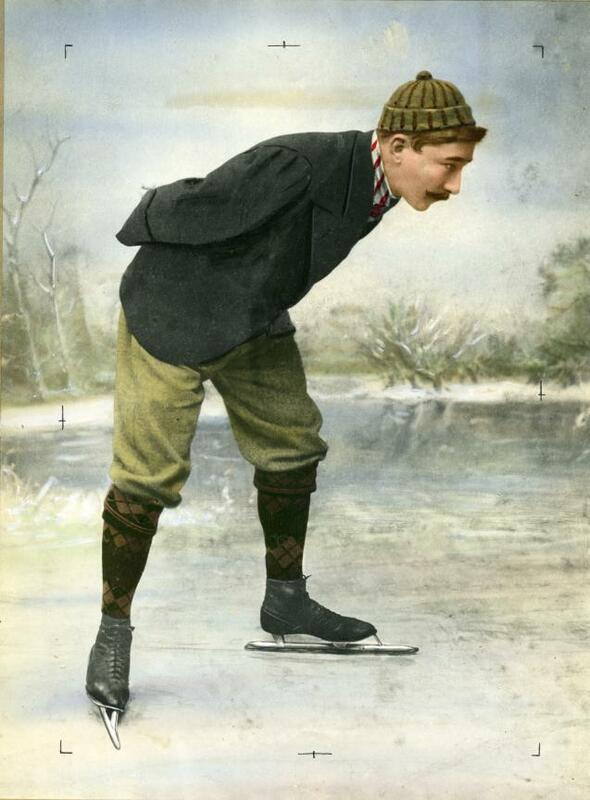 did speed skaters begin to look like they do today. Predictably, he was laughed at initially, until his times very suddenly improved, which had the effect of making everyone adopt his idea. Very quickly skin tight clothing became par for the course, and for a long time lycra and spandex were the standard materials used. However, round about the turn of the millennium it changed again. Well-known shoe company Nike began to experiment with the aerodynamic implications of using different materials on different parts of the suit. 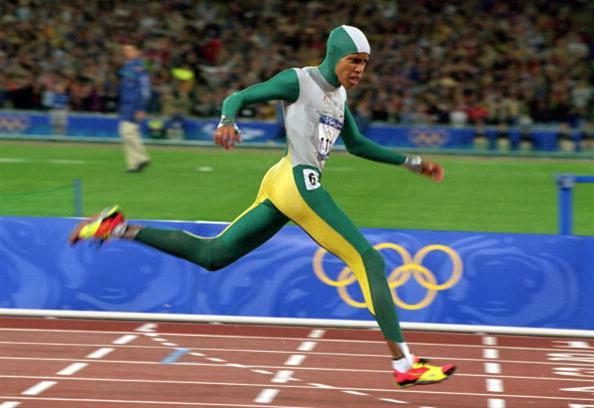 Those readers who also pay attention to the summer olympics will remember Cathy Freeman from Australia winning the 400m while wearing a full-body outfit, which was unusual (and still is) for a track runner. It was reported that while there were slight improvements to be had from wearing the suit, it was very hot and for a runner in a summer olympics, the disadvantage of having to compete while being overheated and clammy inside a full body suit outweighed the benefits, since runners don’t travel through the air as quickly as speed skaters do. The technology however, was swiftly adapted to skating and the Nike “Swift” suit debuted at the 2002 games in Salt Lake City on the American, Dutch, and Australian teams. The main differences were a kind of rubberised material which made up the bulk of the panelling. The surface properties of this material (not having the same texture as a textile-based material) allowed smoother airflow over a skater’s body. The additional structure of wearing what is essentially a rubber suit also allowed suit makers to build suits that helped compress skaters into an ideal skating position. 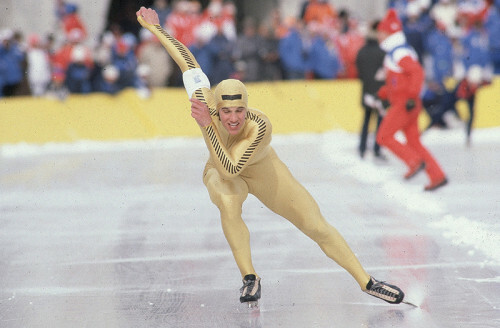 Anyone who has ever worn one of these suits will tell you that standing up in one can sometimes be a little awkward and also comes with some pretty serious camel-toe, since the suit is designed to be worn in a low skating tuck. These suits have slowly evolved over the last ten or so years to incorporate a number of new features. For sleeves and lower legs, a fine fishnet pattern is the surface of choice rather than totally smooth rubber, because when limbs move through the air, they encounter more turbulence, and the more textured surface allows the airflow to stay close to the material for a longer time before it ‘separates’ (the principle is similar to the dimples on a golf ball). There are also panels on the inner thigh which are made of material with a very low coefficient of friction, which enables speed skater’s thighs (which are generally wider than average) to slide past each other more easily. The most recent iteration of these suits is made by a relatively new manufacturer – Under Armour, and sports a few additional features such as the offset zipper which was really more of a comfort concern rather than a performance one. Today Nike, who started it all, doesn’t manufacture its Swift suit anymore, but there are now a diverse plethora of brands who are in on the action – BioRacer, Hunter, Craft, Mizuno, Apogee, and Descente are all brands that Under Armour has to compete with. Truth be told, Most of these suits are actually manufactured in the same factory, and the vast majority of countries basically wear the same suit except in different colours. The exceptions are the Germans and Japanese who wear Mizuno suits, the Americans who wear Under Armour, and the Canadians who used to wear Descente, but now wear Apogee, who were previously only known to manufacture suits for short track. The big question remains – will it make a difference? I’ve already answered this question at the top of the article. The truth is that within the bounds of current technology, the differences are very small (even manufacturer claims are modest – Nike used to claim a 1% advantage over other suits). Nobody has made a suit with as much impact as say the Speedo LZR (in swimming), in that anyone not wearing one would not be competitive. From looking at the results, it is easy to see that all suit manufacturers are well represented at the top of the medal table. Having said that, small difference are still difference. First there is comfort – the Canadians complained a lot when they switched from Descente suits to Apogee suits, but having worn an Apogee suit, all I have to say about that is that the Descente suit must have been very comfortable, because apart from awkward placement of the zip, my Apogee suit is easily the most comfortable one I own. Comfort is important because a suit which feels awful will have a small effect on a skater’s head, and at this level of competition, these very tiny differences can matter. Aerodynamically, the differences would be measured in hundredths of a second in controlled wind tunnel testing. A high body position, or an awkward arm swing, or even forgetting to tuck all of your hair into your hood, would have a greater impact on your time. But those are still hundredths of a second in a sport where gold medals have quite literally been won or lost on those margins (Christine Nesbitt’s victory by 0.02 over Anette Gerritsen in the 1000m in Vancouver comes immediately to mind, but there are no doubt many other examples). So the suits, as they are at the moment, are not game-changers (as long as you’ve got one of the rubber ones, and that it fits well), but they certainly are an essential part of a speed skater’s toolkit. Interesting indeed! Notwithstanding the small differences the suits may make on air friction and the athlete’s physical domain, has any research been done on the ability (if any) for the suit’s to increase performance through correct compression (in mm/Hg; as per medical compression stockings, which promote venous return.. and even some sports compression garments, which claim to improve torque output at the joints, reduce muscle oscillation etc).. especially given the scientific and anecdotal evidence highlighting significant oxygen desaturation in the quadriceps of long trackers?